Twitter’s popularity has spurred the development of countless high-quality apps that let you use Twitter from the web, desktop or even your mobile phone. Here are some of the best programs that will help you use Twitter from your Windows desktop* – you can download any of them for free and they’re all under active development. These are dedicated desktop apps for Twitter and therefore you won’t find any widgets or browser add-ons for Twitter here. 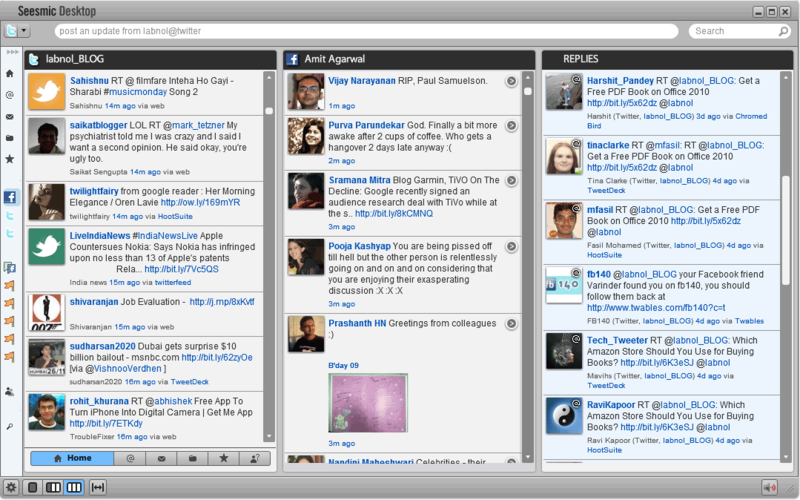 [*] Some of the Twitter clients mentioned here are based on Adobe AIR so you may use them on Linux and Mac as well. Let’s dive in. One of the most popular Twitter apps, TweetDeck is great for managing all your favorite social services including Twitter, Facebook, LinkedIn and MySpace from one place. Its multicolumn interface not only allows you to keep up with all your social accounts but also with Twitter lists and any custom searches that you may have saved inside Twitter. With TweetDeck, you can see a very detailed profile of any Twitter user, you can follow (or unfollow) users and even put them in any of your Twitter lists. TweetDeck supports inline translation so you can easily read foreign language tweets that may appear in your Timeline or search results. 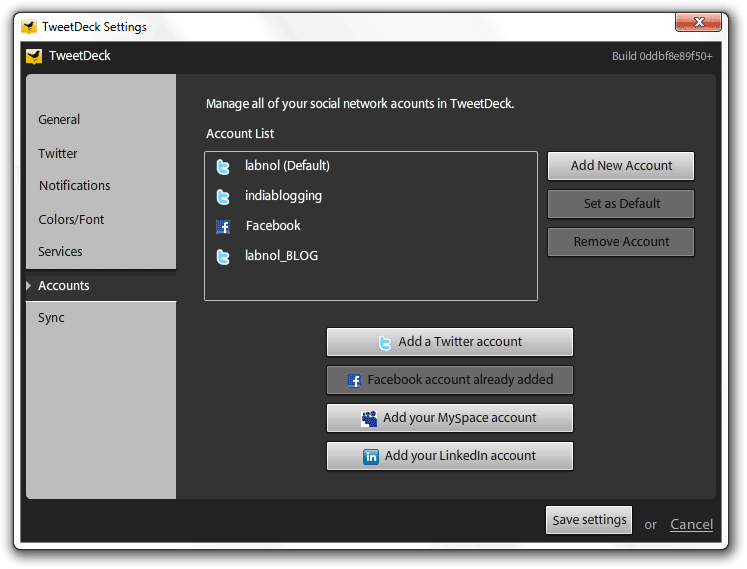 If you work across multiple computers, you can setup an account at TweetDeck and that will save you from the hassle of having to configure Tweetdeck on every single computer. And if you are no big fan of Twitter’s retweet function, you can opt for the classic version of “retweet” (RT). 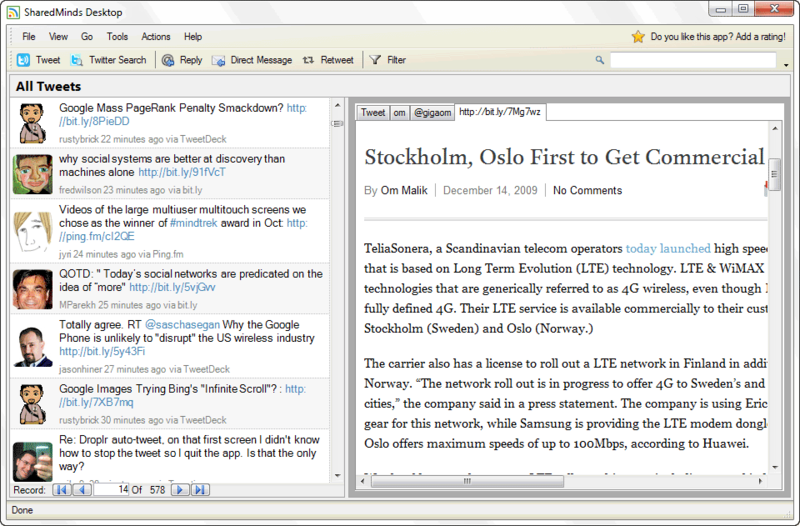 Launched during Microsoft PDC ’09, Seesmic for Windows is a beautiful desktop client for Twitter with a slightly translucent and tabbed interface. Like TweetDeck, Seesmic for Windows can handle multiple Twitter accounts – you can get a combined timeline or look at your @replies, direct messages and sent messages for individual accounts separately. You can post the same update /link /photo to one or more Twitter account simultaneously. The current version is only a preview version but you can expect to see more features as its development progresses. This is a native Windows application and doesn’t require Adobe AIR. 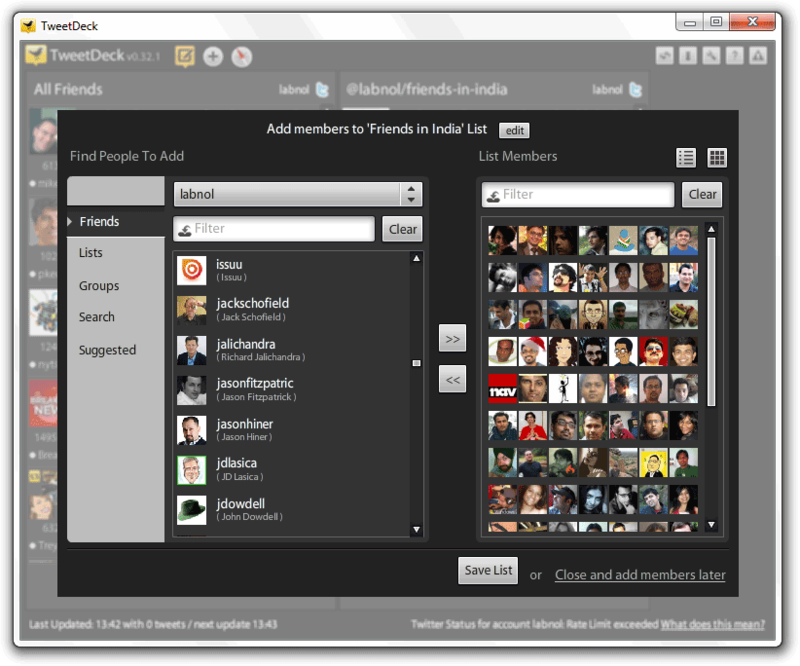 Seesmic Desktop is the original Adobe AIR powered Seesmic app, and it works with Twitter as well as Facebook (including Facebook Pages). 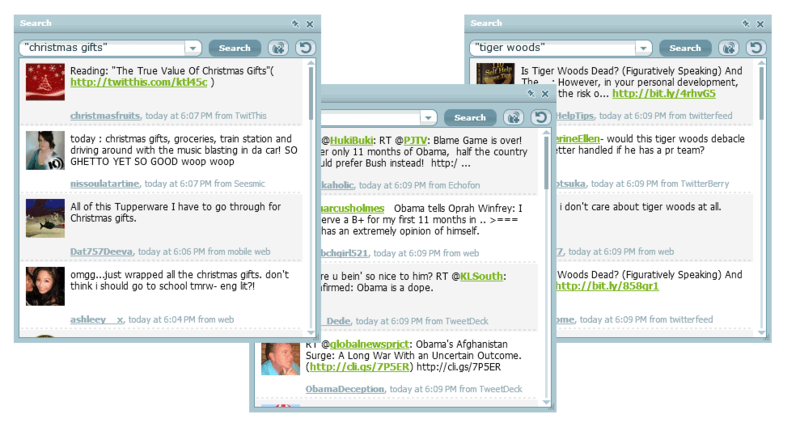 With Seesmic Desktop, you can mark individual tweets as spam, follow new people and unfollow (or even block) other people from your timeline. 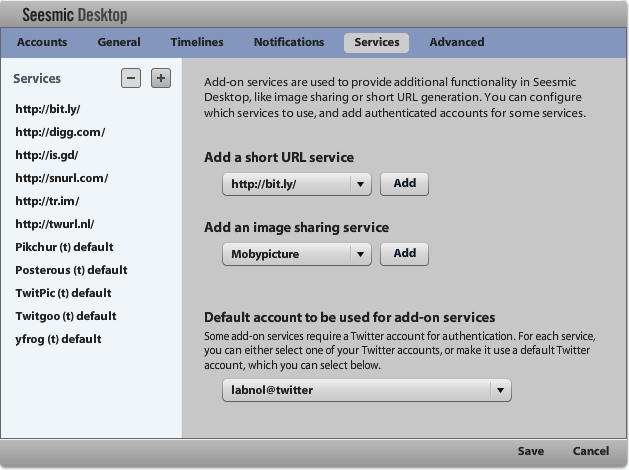 When sharing images on Twitter, you can either upload images from the desktop or capture a picture right from your webcam. Although Seesmic Desktop will run on any operating system, it uses a Mac OS style UI which doesn’t look that good on a Windows desktop. The best part about Seesmic Desktop is its support for Facebook Pages – you can post new messages or even moderate comments on pages that you own. 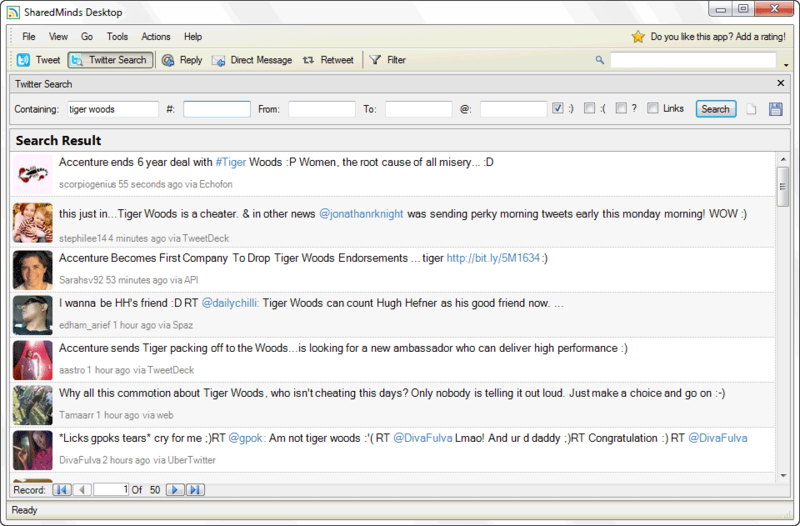 Twhirl is a quick and easy-to-use Twitter client with a minimal yet beautiful UI. 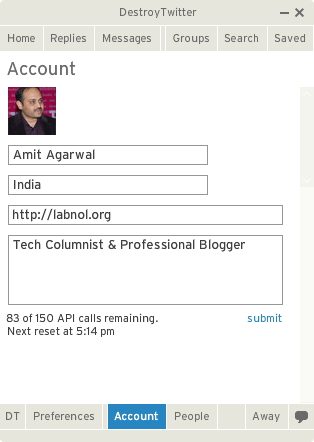 You can even choose your own color schemes and font styles for the UI. 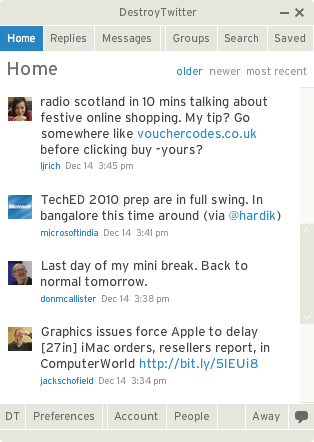 Unlike heavy-weights like Seesmic or TweetDeck, Twhirl doesn’t offer loads of features but if all you need is a way to quickly post status updates on your Twitter timeline, this could be a good choice. 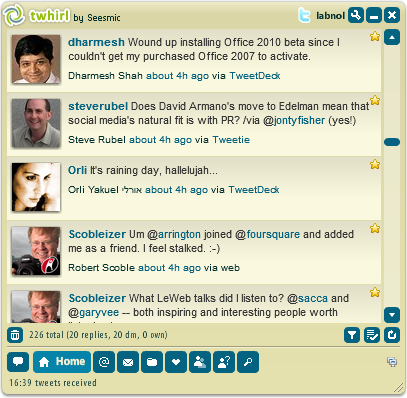 Twirl also offers integration with other less-common networks such as identi.ca and FriendFeed, and lets you cross-post updates to other social networks via Ping.fm. Twhirl is from Seesmic, the same company the develops previously mentioned Seesmic Desktop for AIR and Seemsmic for Windows. 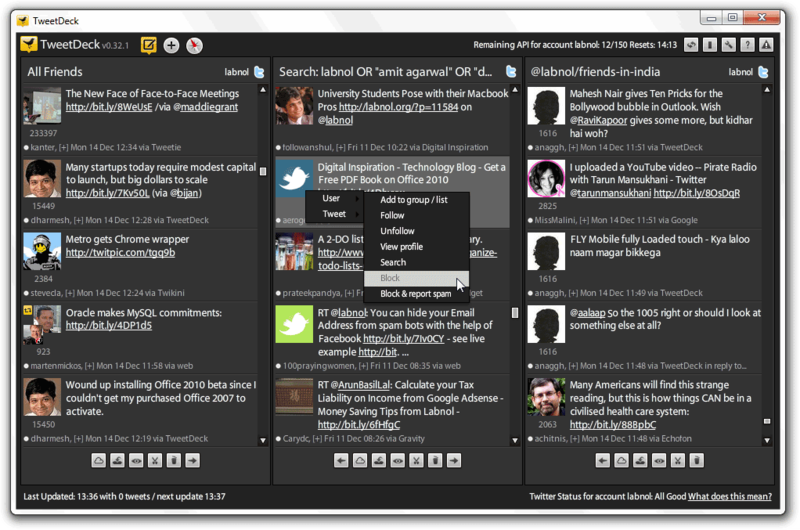 DestroyTwitter, an Adobe AIR powered Twitter desktop client, is again very popular for its minimalistic but innovative interface. The unique thing about Destroy Twitter is its support for themes – you can either download ready-made themes or use the online theme-builder to create one that matches your taste. DestroyTwitter uses impressive transitions when switching from one screen to another and it’s probably the only desktop client that lets you edit your own Twitter profile. Then there’s support for Twitter trends so that you can know what’s hot on Twitter without having to visit the Twitter site. Destroy Twitter is lightweight and extremely fast. You can also configure the application so that it always stays on top of other applications. 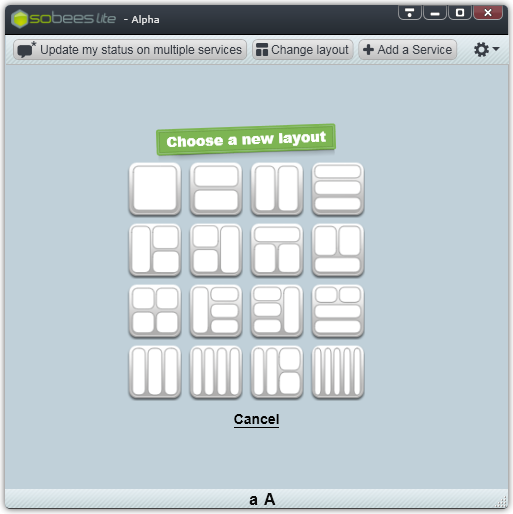 Sobees offers a fresh interface and allows you to choose your own layout for different social services. 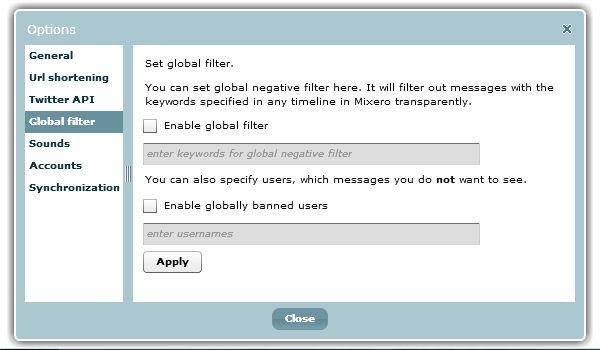 Sobees includes an anti-spam feature that will let you block certain words from appearing in your Twitter stream. You can run Sobees on any Windows computer as long as it has .NET installed. Go here to check whether or not you have the required software on your computer. Blu for Windows in one word is beautiful. 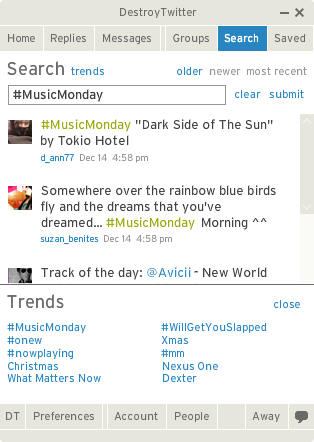 Powered by WPF, Blu showcases your Twitter timeline inside an animated and colorful interface. With Blu, you can reply to your Tweets inline so you don’t lose then current view. Then you can scroll unlimitedly so you can easily see older tweets without having to click anything (just like image search in Bing). But the best part is this – if you see a message in your Twitter stream that is in reply to another tweet, you can click this message to see the original tweet that started the whole conversation. Blu doesn’t support multiple Twitter accounts, you cannot follow your lists in Blu, there’s no option to search tweets yet it’s impressive. AIR powered Mixero is aimed at reducing noise and making it easier for you to keep track of updates that could be more important to you. It offers advanced filtering so you can hide spammers from your Twitter stream (based on usernames or even stop-words), and lets you arrange those you follow into groups that are integrated with Twitter lists. You can preview images from Twitpic, Flickr, YouTube video frames, etc. directly in your timeline. A very unique feature in Mixero is “Conversations” – you can click the bubble (speech) icon next to any tweet to find all other previous tweets that may part of that conversation. You can detach windows from the Mixero app and arrange them anywhere on the desktop as shown in the screenshot above. 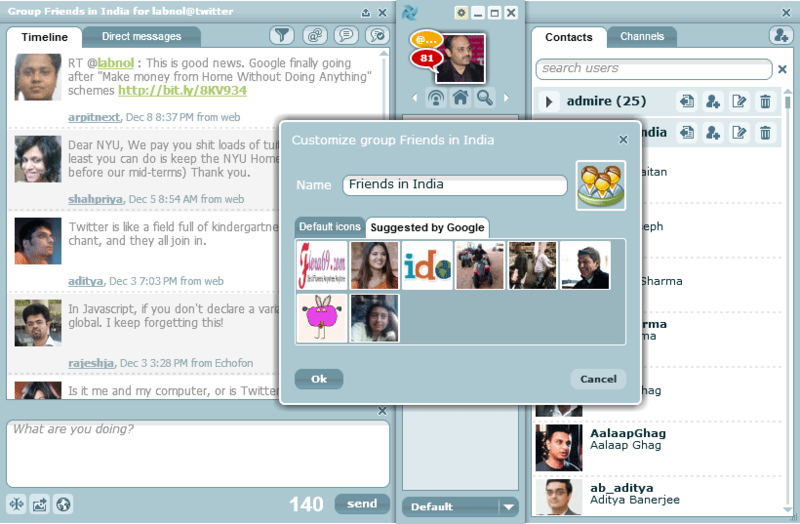 The interface of SharedMinds Desktop for Windows is inspired by Outlook 2007 – you can even change themes from Sliver to Blue as in Microsoft Office. The similarity doesn’t end here – you navigate tweets just like you move across records in an Access database. 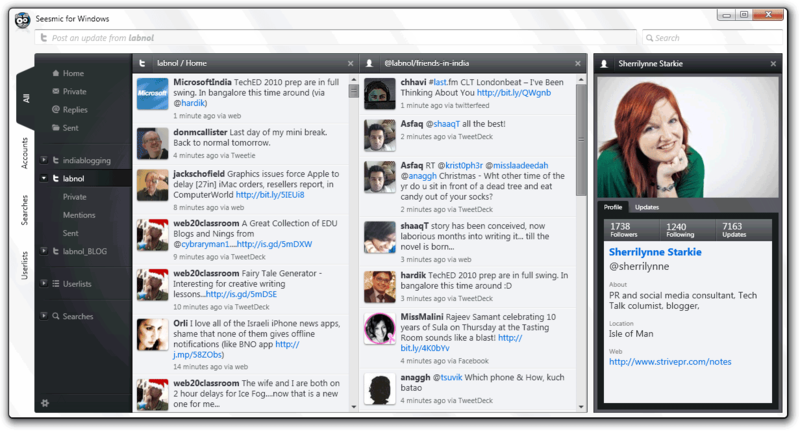 What’s unique about SharedMinds Desktop is the integrated browser – if there’s a link inside a tweet, you can read the corresponding web page directly inside the Twitter client without having to launch a separate tab in your browser. However, you cannot share pictures and other files with this app. 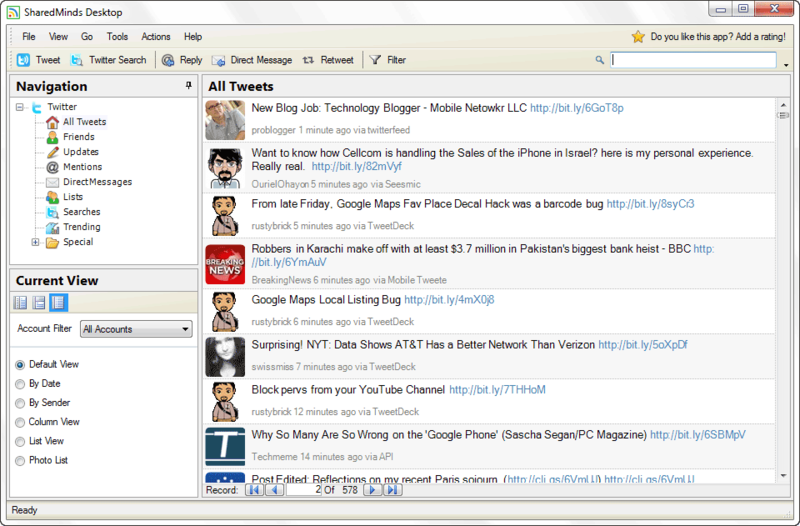 Spaz, DigiTweet and Witty are some of the well know Twitter desktop apps that are open source as well. 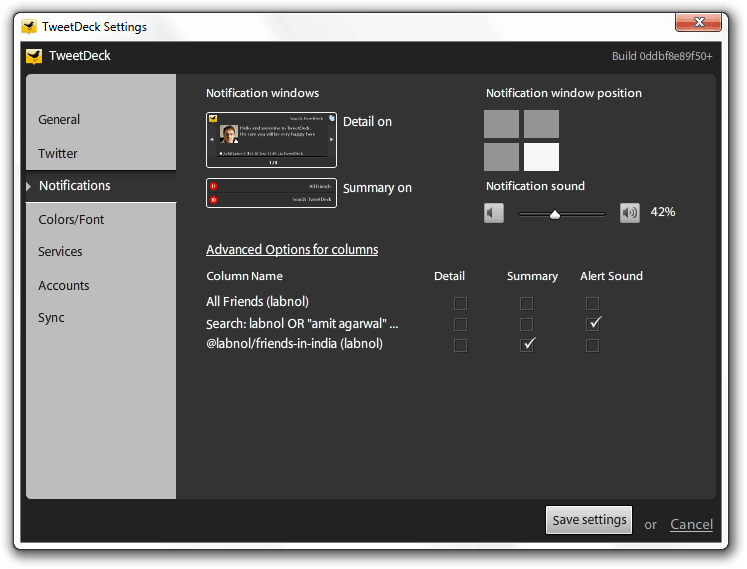 Spaz requires Adobe AIR which Witty and digiTweet are native Windows’ Apps. 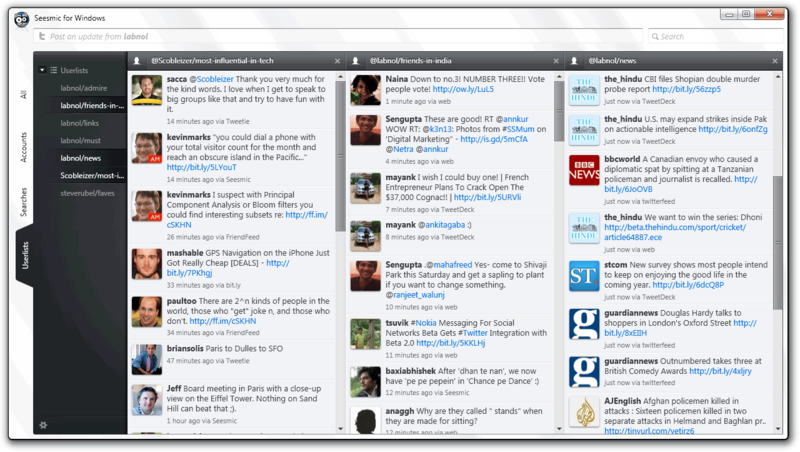 Finally, which is best desktop app for Twitter? Well, it depends. If you are looking for a simple app that can help you send and receive tweets from the desktop without any bells-and-whistles, check out DestroyTwitter or Twhirl. If you are looking for something simple yet stylish, Blue is a good choice. Seesmic for Windows sports an impressive interface but it is missing important features (like support for saved searches) so you should wait for their next release. 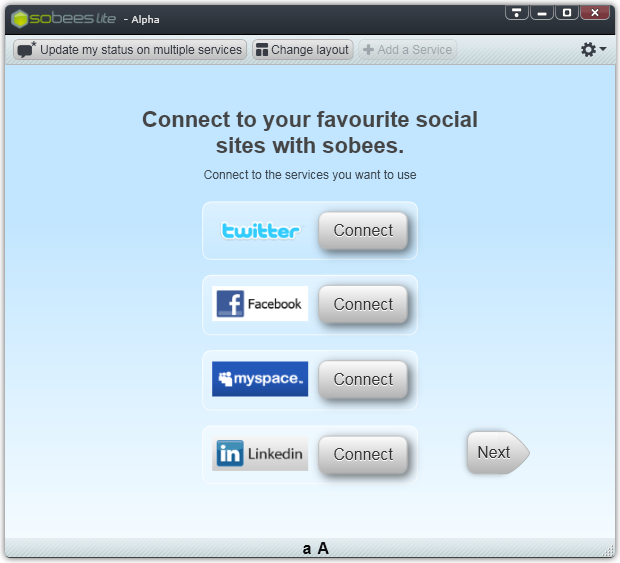 If you want to manage both your Facebook pages and Twitter accounts from the desktop, Seesmic Desktop is an ideal client for you. For everyone else, TweetDeck is a perfect choice. 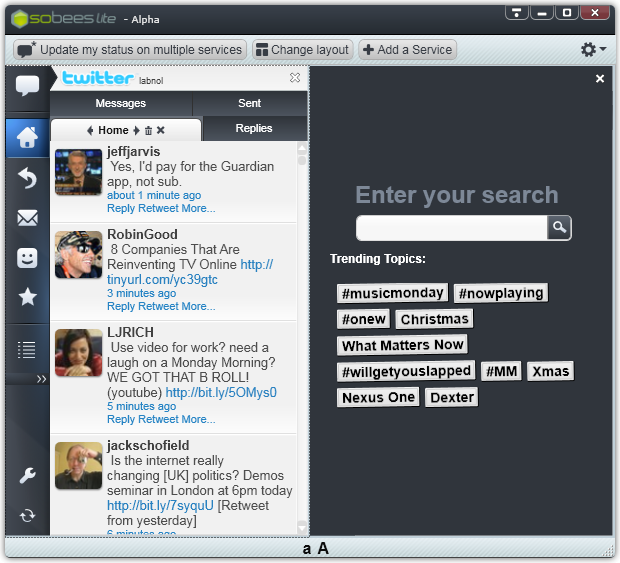 This table shows the main features of each of the Twitter apps covered above. Please note that most of the native Windows Twitter apps mentioned here require .NET 3.5 or newer, so they will only run on Windows XP or newer. Adobe Air based Twitter apps will run on Windows 2000 and newer, as well as Mac OS X 10.4 and newer and modern Linux distros. 1. TwitDoc lets you share files and document on Twitter. Supports PDF, Office documents, video clips and graphic images. 2. TweetShrink is for shaving off those few extra letters off a tweet that has exceeded the 140 character maximum. For instance, “I am fine. How are you doing?” becomes “i’m fine. How R U doing?” thus saving you space for 5 more letters. 3. Twitgoo, yfrog, TwitPic, TweetPhoto are some popular hosting services for sharing photographs (and in some cases, videos) via Twitter.